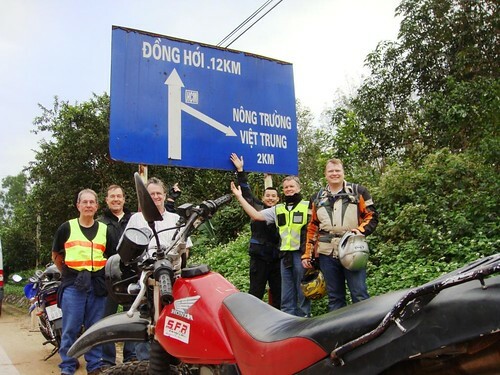 Series of blog entries from Burrows Red Spider group describe their great 16-day motorcycling trip in Vietnam with ACTIVETRAVEL ASIA. Let's follow their trip day by day! They came from London, Birmingham, St. Louis and Chicgao....that gang of Red Spider bikers. All on a mission, to see new things, to meet new people and to have a great adventure and make friends. Today we made our first new friend..... JOSEF, who took our group picture at O'Hare. So we promised him a spot on the RS Website. We are enjoying our pre-departure time getting to know one another better. Lost Luggage has haunted the Red Spider tour at the onset. BeerPong Bill, had his luggage get sent to Honolulu becuase of course the airline code for hong kong which is HKG is so much like HNL....gofigger. So beer pongs bag is yet to arrive. Morrocco Dave had his bag left in Hong Kong but it arrived here today Monday safely. And finally Red Spider Steve received his bag as normal but many items missing and now a part of the TSA Christmas party for 2010 no doubt. Today we enjoyed a short day touring the Hanoi Hilton, and then had a great lunch and a few beers. Now we are fitted with our cycle helmets and chillin at the hotel. And Wingman with all bags in hand has been busy trying to find that perfect sweatshirt for his favorite sweetie. Tonight we will hit the town locally and enjoyed some good local cuisine and some beers and generally some good laughs. Tomorrow, our Tuesday we do some morning sight seeing and then we...................are off folks to Mai Chau around noon for our first leg of the journey. Its early in the morning here and jet lag and anticipation of the trip has the Red Spider gang up early. We will go to the lake where John McCain crashed his plane and a few other sites today before heading out to Mai Chau for our first leg of the trip. We stay in a local home tonight so the next website update may be a few days away. We will update when we can so be patient. We, and especially Beer Pong, hopes that Beer Pongs bag will catch up to us tonight. Wish us well and we send our greetings to all of you enjoying our trip. Sorry that we have been off line for so long but we have not had any i-net connections for 3 days. And we have so much to catch up on. Since we left Mai Chau, the Thai community we have moved south by about 600 KM's to Tan Ky and now to Dong Hoi. Check the map on the "Tour" tab if you really want to know where that is. So what have we seen and experienced since we last logged on? 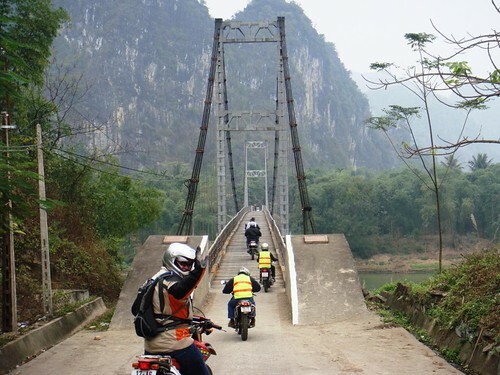 • we learned that vietnam roads are for bikes, people, motorcycles, cars, trucks, cattle, dogs, cats and people. • we saw "Indian Jones" type bridges and crossed two of them ourselves on the bikes. • We decided that a rainy day is good day to load the bikes in a truck and take the van to the next destination rather than risk harm on a slippery road. Tomorrow, our Friday, we travel from Dong Hoi south to the infamous DMZ and end up in the coastal city of Dong Ha. Today we are off to Dong Ha, similar sound as where we are now which is Dong Hoi. On the way we will visit several famous spots from the Vietnam War and will pass thru the DMZ. We departed Dong Hoi, a city of about 500,000 people around 9:00am and headed to our first site in a light mist and drizzle which made the ride more interesting, but we maintained slow pace until the roads dried out. The first stop was the Truong Son National Cemetery....the Vietnamese version of Arlington Cemetery. More than 10,000 soldiers are buried here and we paid our respects. Next rode to the Vinh Moc Tunnel. 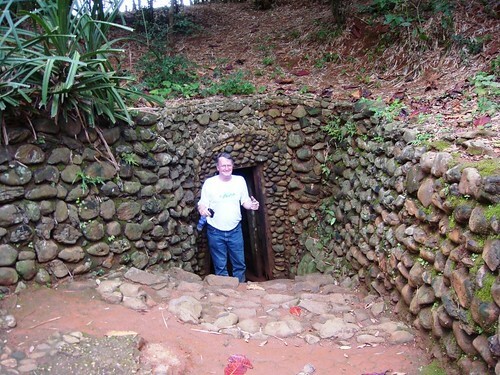 An amazing place with three underground tunnel systems that the VC used to hide from Americans and plan attacks on the South. There are over 40 KM's of underground tunnels and some are more than 24 meters below the surface. Some of the bikers adventured into the tunnels, but Red Spider and Feel Good took a pass. Then we moved on along the coast which was beautiful and headed to the 17th Parallell.....the dividing line in history between the north and the south. We viewed the memorials on both the north side of the river and the south side of the river built to honor the respective soldiers who gave their lives. We also visited the Doc Mieu firebase, which was a French installation perched high on a hill just over the boarder to the south and a great place to launch many rocket attacks on the north we suspect. Today we completed another 250 KM's of our trip bring us to about 550KM's in total under our belts.....or butts as the case may be. Tomorrow we head for Khe Sanh Air Base among other things.